History | AGL | Applied GeoLogics Inc.
AGL, based in Guelph, Ontario, was founded in 1997 and, as such, have provided work and asset management software and related services to the public sector for over two decades! The AGL team consists of sales and support staff, project managers, analysts, and administrative personnel. AGL and Cartegraph Systems LLC together have a wealth of industry knowledge that all our clients benefit from. This knowledge goes beyond just software. We understand trends. We understand infrastructure, and work and asset management principals. We understand local government organizations. In 1985 when Dr. Ed Shewen, now President and Senior Consultant of AGL, first became involved in the research and development of infrastructure asset management software solutions for local government organizations, he realized that analytical asset management software alone was not enough. For example, analytical results where often based on a point-in-time survey of asset condition that did not accommodate the real-world impact of the continuing asset specific degradation, or the daily maintenance and rehabilitation work. He determined that reliable analytical results need current, accurate data which requires a software solution that is incorporated into the daily business operations of the local government organization – maintaining the foundation asset repository in the most accurate state possible. In 2000, AGL and Cartegraph Systems LLC formed a strategic partnership. Together they have implemented this philosophy of fully integrating work and asset management software. Today, the Cartegraph OMS is the most advanced “GIS centric” work and asset management public sector software solution in North America. With the Cartegraph OMS, all departments within a local government organization can easily access, share, and analyse current data through a unified and simplified web-based user interface. Functionality includes work and asset management (e.g. preventative maintenance, condition management, capital planning, financial reporting), resource and materials management, fleet management, and request management. By leveraging the modern software integration tools of the Cartegraph OMS, in additional to years of programming and industry knowledge, AGL has produced software integrations with geographic information systems (GIS), customer relationship management systems (CRM), financial systems, payroll systems, budgeting systems, permitting systems, fuel systems, automatic vehicle location (AVL), and Supervisory Control and Data Acquisition (SCADA) systems. The Cartegraph OMS, replaced the Cartegraph Navigator legacy platform in 2012. Today, the Cartegraph OMS is utilized by 265+ local government organizations across the Untied States and 16+ local government organizations across Canada, including: The City of Toronto, ON (Traffic and Public Realm), The City of Victoria, B.C., The City of Niagara Falls, ON, The Township of Bonnechere Valley, ON, The Town of High River, A.B. Oxford County, ON, and more. Since January 2017, 54+ additional local government organizations have adopted the Cartegraph OMS. 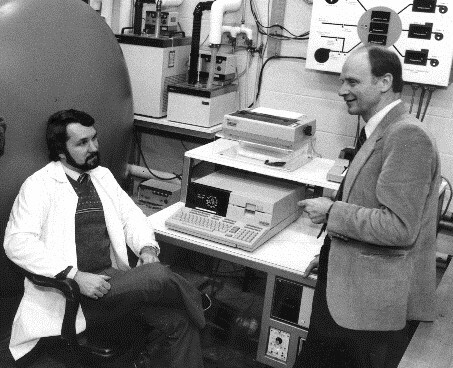 Figure 1 – Dr. Ed Shewen, now President and Senior Consultant of AGL, seated in his lab at the University of Waterloo discussing advanced infrastructure design with colleagues (1983).